Ben Murnane is a writer who lives in Wicklow and suffers from a rare genetic disorder, Fanconi anaemia. He describes how creativity helped him cope with his disease, and discusses a new film project involving teenagers with chronic illnesses. My life has been dominated by two fluids: blood and ink. Blood is the source of so many issues to do with my disease; ink has been my instrument of escape. Illness and creativity, hospital and writing, have always been fused together for me. At age nine I was diagnosed with Fanconi anaemia (FA), a genetic disorder which affects some two or three people in every million. When I was forced to stay out of school shortly after diagnosis, I used my time at home to make magazines, filling pages with words and pictures and sellotaping the sheets together. FA causes bone marrow failure; it results in low blood counts, leading to low energy and increased risk of injury and infection. FA patients have a much greater risk of contracting cancer than the general population. The average life expectancy remains just 29. I was on steroids until I was 15. I then spent a year waiting for a matching bone marrow donor, during which I received monthly blood transfusions. I would sit on a hospital bed or in a hospital chair, while the blood trickled into me, writing away about what was happening to me – or what wasn’t – in the form of short stories, reflections and poems. The blood flowing into me kept my body alive, while the ink flowing from my pen kept my mind and spirit alive. Writing was a means of escaping the pain of my condition by imagining and creating other realities. It was also a method of explaining my illness to myself, by documenting experiences, thoughts and emotions, and trying to build something meaningful from them. I didn’t think about it in such elaborate terms, but even at a young age, it was the process of transition or transformation that interested me: taking my illness as a starting point, and through writing, turning it into a work that could be experienced by others, something that would move them, make them laugh (because many hospital stories are darkly hilarious) or simply inform. I wasn’t writing for myself, I was writing for the validation of myself and my suffering – through others reading my crafted words. As such, I published my musings in a small homemade magazine distributed to family and friends. And, my first ‘properly published’ piece came while I waited for the transplant – in the form of an article on the transition year page in the Irish Times. When I underwent my bone marrow transplant in 2001, the nadir of my health was matched by a creative nadir: only material that could be wiped down with alcohol could be brought into the isolation room, ruling out writing paper. The new lease of life afforded me in the wake of the transplant (I have been mostly very well since then) led to my first book – a memoir of living with FA, published by A&A Farmar in 2008, entitled Two in a Million. The book’s publication finally gave me the feeling that I had come to terms with my illness. I had made something definitive of it now, something that could sit on bookshelves and in libraries. Something that said: I was here. 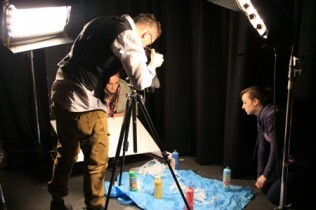 Recently, Two in a Million has been adapted into a short film in conjunction with arts and health organisation Helium. The film was made with the involvement of teenagers living with chronic illnesses, who took on roles from acting and set design to editing and assisting with direction. The film is called Two Suitcases, a name which comes from something a nurse once told me. She said that when you go into hospital, you take two suitcases with you; one to carry your clothes, and another to pack away your dignity. The film is part of a wider project, spearheaded by the director, Emma Eager, to engage with teenagers who have chronic illnesses, and provide outlets for their creative pursuits. The Two Suitcases Project does what art should: it directly impacts on people’s lives. In 2007, while studying in college, I interviewed Trinity College Dublin drama studies lecturer, Chrissie Poulter. Chrissie has worked extensively on arts projects with children from sectarian communities in Northern Ireland, and told me how often the best thing you can do to engage these kids is to talk to them about an ‘everyday curiosity’, such as what their favourite music is – meet them on a human and purely personal level. Art can be a way ‘to find a voice to speak about you before speaking about the things you’re “supposed to” speak about’. That’s a lesson that should certainly be applied to use of the arts in healthcare: at its most effective it’s about providing a space for expression, whatever that entails, and perhaps for letting out some of that packed-away dignity. I was lucky in that writing was an outlet I could create for myself, even while in hospital. The process of transition is one that continues to fascinate me; how someone with an illness, engaging in art, moves from their experiences of illness, through creative work, to produce a new experience: a creative product – a poem, script, book, painting, piece of music, and so on. What part does each of three elements play in the process: the illness, the person and the art? And where is the line between them? The Two Suitcases Project involves considering all these elements, towards a broadly therapeutic goal. I said at the outset that writing, creativity, was for me a means of escaping my illness. Yet, writing has also cemented Fanconi anaemia as a defining aspect of my life. I never wanted FA to determine what I did, and yet my illness is the foundation for much of what I’ve done: from the memoir, to Two Suitcases, to this article. I don’t knock it, by any means. It just gives me pause to consider whether the person can ever be severed from the illness. When I was having those blood transfusions, the blood flowed into my hand through a cannula, while the ink flowed from the pen in my other hand. We were all part of the same event: the illness, the person and the creativity. Creativity can’t be separated from healthcare for me, nor my health from pursuit of the creative. Two Suitcases is available to view here. With every good wish for your future success in the literary world. Awesome job in exposing FA! It’s great to know that when my children are older and undergo bmt like you did, they will know they aren’t alone. Wishing you all the best! Well said. Beautifully done. Thank you. Oregon, USA.